Friday’s weather was chilly and the day was long because of a morning weather delay, but the Community School tennis team enjoyed another successful 3A District 4/5 tournament competition at Sun Valley Tennis Club. Coach Phil Huss’ Cutthroats nailed down their 10th consecutive district tennis tournament title and 16th in 17 years with 149 points among the five events, compared to 58 points for Sugar-Salem of Sugar City and 44 for Gooding. During the one-day state-qualifying tournament that finally wrapped up in darkness about 9 p.m. Friday, the Cutthroats qualified 13 of their 18 entrants for the State 3A tournament scheduled for Friday and Saturday, May 16-17 at Vallivue High in Caldwell. Gooding qualified six players for state and Sugar-Salem will send five to Vallivue. The Cutthroats (22-11 in Friday matches) captured first places in four of the five events, and swept the top two placements in boys’ and girls’ singles and boys’ doubles. In girls’ singles, Sun Valley duplicated last year’s result by finishing 1-2-3 in placings with Olivia Ott, Hannah Conn and Blair Baker. Overall in singles, the Cutthroats went 15-5. Overall: 1—Community School 149 points. 2—Sugar-Salem 58. 3—Gooding 44. 4—Wendell 1. Boys: 1—Community School 79 points. 2—Sugar-Salem 30.5. 3—Gooding 18. 4—Wendell 1. Girls: 1—Community School 70 points. 2—Sugar-Salem 27.5. 3—Gooding 26. · Boys’ singles—Championship: No. 1-seeded Willis Sanchez-duPont (CS junior) 6-3, 6-3 over No. 2-seeded George Everitt (CS junior) in a rematch of last year’s district championship won by Sanchez-duPont. Third place: No. 3-seeded Sam Pigott (S-S) 6-2, 6-2 over Henry Everitt (CS sophomore). · Girls’ singles—Championship: No. 1-seeded Olivia Ott (CS sophomore) 7-6 (5), 6-3 over No. 3-seeded Hannah Conn (CS sophomore) in a rematch of last year’s district championship won by Ott. Third place: Blair Baker (CS sophomore) 6-0, 6-0 over No. 4-seeded Alex Blaser (S-S). · Boys’ doubles—Championship: No. 2-seeded Doug DuFur-Dan DuFur (CS senior-sophomore) 4-6, 6-4, 6-3 over No. 1-seeded Roger Figge-Trenor Gould (CS juniors). Third place: Unseeded Ivan Garcia-Daniel Valdez (Gooding) 6-3, 6-2 over unseeded Jeff Wilding-Corey Andrews (S-S). · Girls’ doubles—Championship: No. 1-seeded Emily Siegel-Samantha Busby (CS sophomores) 6-1, 6-1 over No. 3-seeded Liz Dohren-Miranda Sabala (Gooding). Third place: No. 2-seeded Samantha Weber-McKay Owens (S-S) 5-7, 6-0, 6-2 over unseeded Taylor Phillips-Jacquie Perkins (Gooding). · Mixed doubles—Championship: No. 1-seeded defending champions Landan Weber-Felicia Nelson (S-S) 6-3, 6-4 over No. 3-seeded Reed Roudabush-Jolie Blair (CS seniors). Third place: No. 2-seeded Jesse Cardenas-Morgan McCarthy (Gooding) 6-3 2-6, 6-2 over unseeded Zach Roselle-Chaise Dobson (S-S). 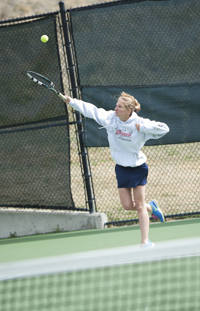 This year’s State 3A tennis tournament staged by the Idaho High School Activities Association will again be a 12-team draw format. State 3A brackets will be posted by midweek on the IHSAA Web site. Last year, Fruitland won the State 3A overall title 116-94 over Parma with Weiser (37) and the Community School (29) in fourth place. The top boys’ team was Fruitland for its first-ever state boys’ title 54-41 over Parma. Fruitland captured its third consecutive state girls’ team title 62-53 over Parma, with the Community School in third place with 17 points. Perennial State 3A power Parma, winless in state team championships since 2011, last weekend earned the 3A District 3 boys’ championship 73-54 over Fruitland and added the 3A District 3 girls’ title 75-64 over Fruitland.